Today will be a quick post with some sugar free diet tips as we get ready for our 10 Day Fed Up Challenge. Are you ready for Monday?? The next challenge starts January 11, 2016. Go here for the official announcement. Your mother told you to. Dr. Oz says it’s good. Health magazines are always harping on it. Why won’t they just leave you alone? 2. Don’t let yourself get hangry. Who me? Grumpy, crabby, irritable? Nooo get serious. I’m a sweetheart when I’m starving. You too? Okay maybe I act a little angry at the world when I’ve starved myself of all of my favorite foods – but nawww – don’t be afraid of me even though it may seem like I’ll bite your head off for popping a few M&Ms in front of me. No really, come a little closer. Have plenty of fresh, healthy snacks ready to go. Cut up veggies. Make a homemade dipping sauce. Cut up fruit. Buy hummus. Pack almonds in little containers for work days. Whatever your snack preferences are, get them ready PRIOR to to the start of your work week. If you let hunger strike, you’re more likely to go on a cupcake rage and scream obscenities at innocent bakery workers. Yeah, I know fruit has a lot of natural sugar and if you can avoid it, great. But for a sweet-tooth like me, fruit saved me during the last challenge. It made me feel like I was getting the sweets I craved. I made a really tasty Chopped Fresh Fruit Salad (minus the sugar/honey) and it put an end to my dessert cravings. Watermelon is great, too. Low calorie, sweet, and still kept me on track. Charlie Sheen calls this WINNING. Don’t dangle carrots in your face. (Or more appropriately, carrot cake.) If you’ve got tempting sweets and processed foods in your cupboards – get rid of them! How? Box them up, tape the box shut and put them where you won’t see them and save for a later date. Donate them to a food bank or a neighbor. You’re breaking an addiction. One teeny weeny piece of candy will only make the rest of the day (and possibly the next day) that much harder for you and your cravings. Remember that, although this can be a lifestyle change for you in the long run, this 10-day challenge (right now) is only an experiment. Having a “cheat” won’t help you see the benefits of the experiment. 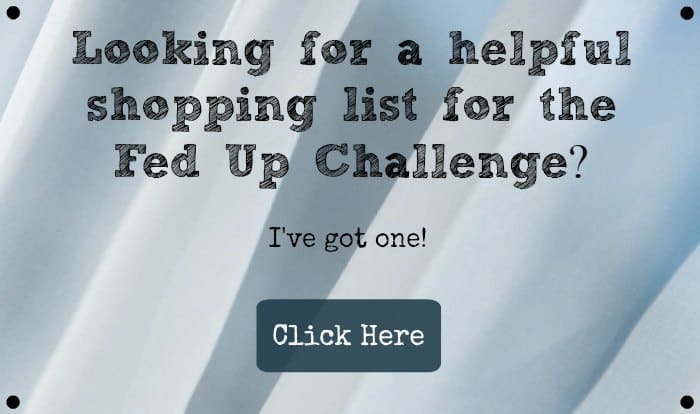 If you haven’t seen the movie Fed Up that prompted this 10-day sugar free challenge, you should. It’s shocking and will give you the kick in the tight pants you probably need. What about you? Do you have any sugar free diet tips or recipes you’d like to share? Please tell us in the comments below! I’ll be checking in with you throughout the challenge which starts January 11, 2016. Good luck! Want to see how I did on last year’s challenge? I had some good days and some rough days. 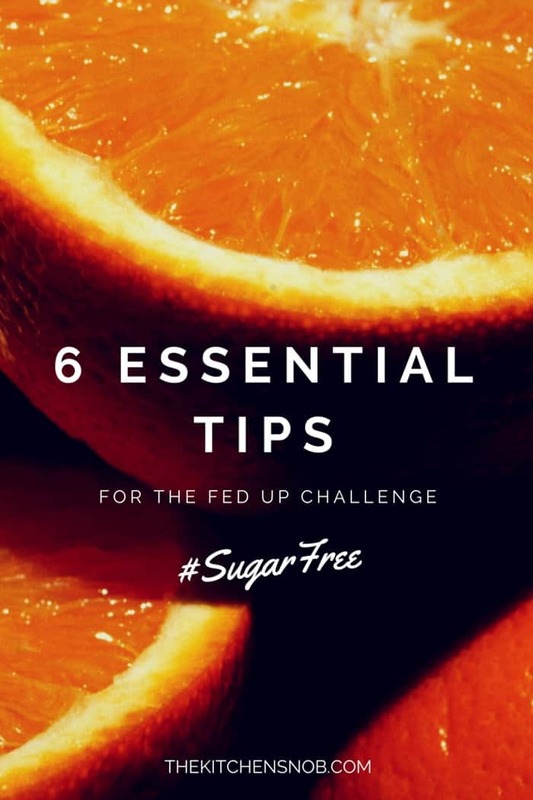 Here are some links: Day 1, Day 3, Day 5, Day 8, 5 Things I Learned While On A Sugar Free Diet, and Why You Can’t Have Sugar Substitutes During The Fed Up Challenge. 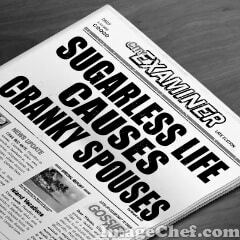 Sugar free is hard, not other way around it. Huge for me to be kind to myself and have some frozen chicken breasts and veg for when the beasts are squakin’ and I’ve got nothin’. Some days are better than others, I will say that after watching this movie I put the Easter Baskets in the garage hinting that I think some ants found the candy. I have always said there should be a 12 step program for sugar, it makes perfect sense. I need a sponsor, similar to my “lip stuff” addiction. a sponsor for that too. Anyhoo. One day at a time and today was alright. Love the feedback. Hi Gail! It sounds like you’re doing great. I know what you mean about the effort and energy it takes. Hopefully in the future, food manufacturers will change and we’ll have more options. I think if you live in a bigger city, it might be easier. But for my neck of the woods, eating out is out of the question. Quick question. You mentioned buying hummus if doing the 10 day challenge. The hummus I bought said 0g sugar, but then I noticed sugar was listed as one of the last ingredients. It’s the Sabra spinach artichoke hummus. Is this okay? Hi Tracey. I looked up the Sabra hummus nutrition label and don’t understand how there can be sugar in the ingredients but no grams of sugar in the product. Unless the amount comes to less than 1 gram? You could always contact Sabra and ask them. Sorry I don’t have more information about their products. If you want to do the challenge with absolutely no sugar (which is the point) then I would say to not have the hummus since there is technically sugar in their product. Thanks! I had bought & was eating it before the challenge. It was only after I read the label did I catch it. On day 3 & so far so good! I had a bad headache by the afternoon on day 1. Day 2 went great, didn’t even feel hungry once. Today a little tired & my body is achy & the cravings kicked in big time tonight after I ate dinner. Had some fruit to try & curb it but it’s still there. It’s taking every bit of willpower I have but I’m gonna resist! I have been substituting my rice and potatoes with cauliflower. Last night we had mashed cauliflower with rosemary chicken. Tonight I made Moroccan chicken with green olives over cauliflower rice. It was awesome! This is day 2 of the challenge and today I felt like I had that hangover feeling in my eyes. Last night was crazy, I was just going to eat a couple olives as a late night mini snack and all of a sudden I felt sssssooooooo hungry and I just kept needing more snacks…lol I felt like a crazy addict. I’ve never liked water so its been easier to drink water with lemons in it. Btw the cauliflower is super filling which really helps along with drinking my lemon water. Hi Brandy. I’ve never tried the cauliflower trick. I should! My husband doesn’t like cauliflower so I’d have to really sneak it past him. 😉 Hope the challenge went well for you. I’d love to hear an update! Hard enough avoid sugar but my son is not only sugar intolerant but lactose intolerant. Makes the impossible even more challenging!! Hi, Toni. Thanks for your comment. That would be extremely tough! Hope you find some options out there.